Design challenges aren't nearly as challenging these days. The longer I am in the business, the easier it seems to get. That being said, I came across one of the biggest challenges of my career this last year. My wonderful boyfriend moved in and brought one piece of furniture . 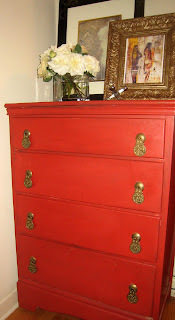 . . a brightly red painted, distressed, children’s dresser. Even worse, there was only one place that it would fit, the living room. I was instructed that I could not paint it and it being his childhood dresser, that he had an attachment to, I couldn’t chuck it. After a long review of our relationship I decided not to dump him. As I sat and stared at his little setup with his dresser and some of his daughters things displayed on top, I knew there wasn’t much I could do but I had to do something. A quick change to some diverse accessories and my “bright” idea of getting great, big Chinese hardware to give a more grown-up, eclectic vibe and Wa-la! You can find some great hardware, including this, at the link below. Whether it’s a kid’s dresser, your great grandmother’s console or your dated kitchen cabinets, consider updating the details. New hardware is a great start! !